Why do we kill people to show people who kill people that killing people is wrong? When I think about what happened last night during the election, I think back to that sign. It’s true that this is a “historic moment” in every sense of the term, though my heart aches to type those words: for the first time in the history of the United States, we have elected a president-to-be who has never held public office or served in the military. We have elected an individual who has demonstrated repeatedly his fundamental lack of respect for women, minorities, the LGBT community, the list goes on–as well as his inability to comprehend the importance of international cooperation in a post-sovereignty world, to understand that united with the world we stand, divided from it in aggressive assertion of our superiority–we fall. Why do we hate people who hate people to show that hating people is wrong? I am under no delusion that scapegoating and mudslinging are “new” concepts in the political arena. In fact, as far as I can remember they have always been a part of (and presumably will continue to be) something like standard practice along the campaign trail, for better or for worse. That being said, the levels of hatred that fueled both the Clinton and Trump campaigns this time around absolutely floored me. When the results started trickling in around 6 PM PST, the tenor of my generally liberal Facebook news feed gradually shifted from one of self-celebrating elation (artsy “I VOTED” stickers and cheery injunctions to “go vote!”) to wary incredulity, then from indignant disbelief (“Wtf Florida you had one job,” “gonna go get alcohol now”) to downright fury. It was as if all of the vitriol from the deepest recesses of my newsfeed’s soul suddenly burst through a dam that had been pounded away at day after day, year after year, and by the time 11 o’ clock rolled around I found myself drowning virtually in a sea of spewing, endless epithets about the events of the day. To be clear: yes, I believe that this is the worst possible decision we could have made under the circumstances. No, I have never come so close to crying over a political outcome before. But hatred–and that comes in all forms, from rampant racism to the death wishes that you send to everyone who voted for someone who I now have to call the next president of the United States–is reactive, not responsive. Hatred produces misunderstandings, which in turn begets hatred. 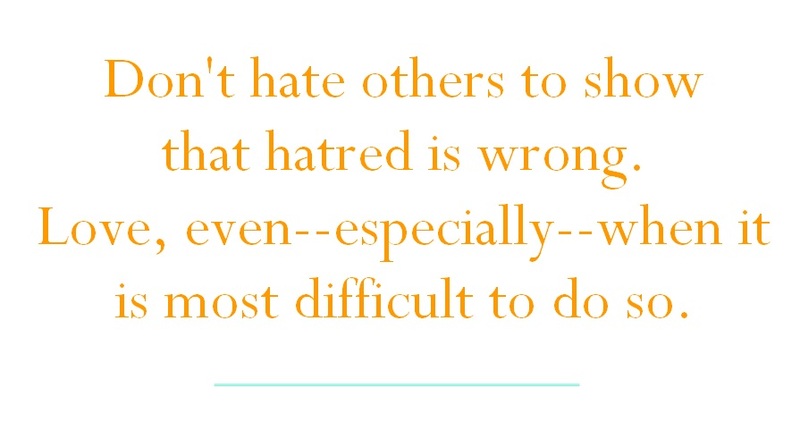 And hatred is not the answer. While I believe that non-violent, community-oriented expressions of discontent are vital to our democracy, I can’t help but imagine what would happen if we took the frustration of every single student in that angry, swearing mob and channeled that energy into something more productive: say, submitting an organized op-ed that can mobilize change at a local level or creating curricula (not only during election season) that encourages youths to be more responsibly informed about world and domestic affairs. Giving in to our rage and despair may be the easy thing to do, and that is why so often it is the first thing that we do, and not only when it comes to politics. But because it is more about self-gratification and personal release than responsible action, it is also the selfish thing to do. And as last night showed those of us who were stunned by the results, we can no longer afford to think in such selfish terms. I’m writing this post (as mentioned in the Facebook status update posted above) in the hopes of opening up a space for as many viewpoints on last night’s events as possible. 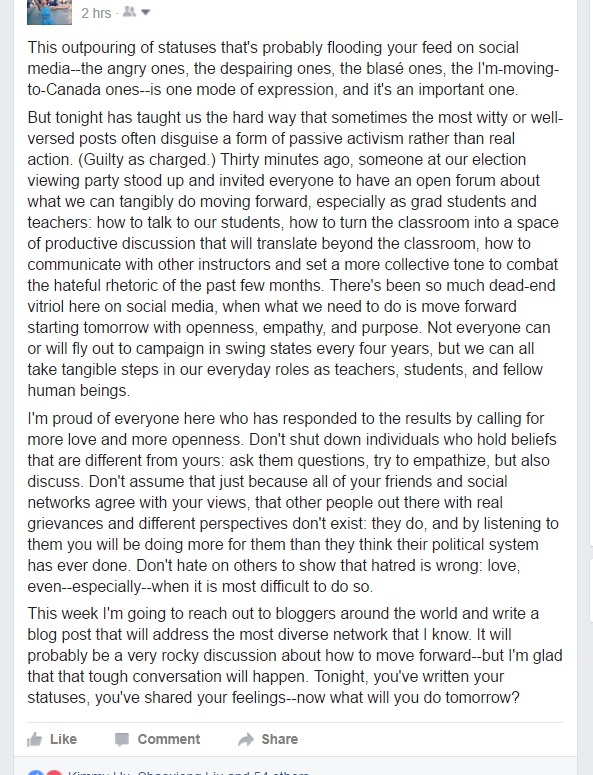 I don’t normally write about politics here, but after seeing the near-monolithic outpouring of reactivity from my (extremely beloved) friends on Facebook, I realized that I have nothing to lose and everything to gain if I try to make sense of everything with the help of the most diverse community I know: you. Whether you are a Democrat, a Republican, an unaffiliated voter, someone who has experienced conflict with close friends and family about voting choices, an outsider looking in from beyond the United States, or something else, I would love for you to share your thoughts about last night’s election below. Let’s make this a safe, productive, and thought-provoking conversation about how to move forward after election night. How closely did you follow the events of this election cycle? What are your thoughts on the campaigns and process that led up to election night? How did you and/or your loved ones respond to the outcome of the election? Do you and your network (of friends, colleagues, aquaintances, etc.) generally hold similar political and/or socioeconomic values? Or do you surround yourself with groups that are fairly diverse in the political beliefs? Did you encounter any disagreements or points of contention with people in your social network about the election? How did you address or resolve these issues? How do you plan to move forward now that the election is over? Feel free to leave your thoughts, questions, and comments about last night’s election below, as well as to encourage your social network to participate as well. While all viewpoints are welcome, please remember that this is a space for open, respectful conversations. i can’t seem to stop crying; while the majority of the people i have on social media have similar viewpoints as me, there are a couple people who don’t. which is fine, but i feel hurt that they feel such a way, even though it’s completely their decision to make. and i just feel paralyzed. while i admire those who say that they will fight to love and help and volunteer and donate, i have a hard time imagining how that would come to fruition on a large scale, especially given the actions that i predict will be coming soon. It’s all a little bit surreal, isn’t it? We definitely had the same experience here, where everyone walked around as if we were in a dream. That being said, it was astounding how much commiseration happened throughout the day–people consoling one another, giving one another reassuring words of hope, and simply making eye contact with one another. It’s small, but perhaps by engaging in these moments of mutual recognition we can move forward in a more open and sensitive way. I’m sending you all the hugs and good wishes, Heather! Totally empathize. It’s hard to wrap my mind around the idea of having Trump as our next president. I think part of it is that living in the Bay Area we’re surrounded by liberals, and those who aren’t, were secretive about their viewpoints. It’s hard to see how the rest of the country could feel that Trump would make a good president without a political/military background or be okay with the stories that surround him. But the thing is, we’ve always been okay in the end. We’ve rallied and we moved on. Like when Arnold Schwarzenegger became the governor of California. He had no experience, yet he managed to lead California for years. There were some good policies and there were some not so great ones. And maybe it’ll be the same with Trump. It’ll take awhile to get there, but hopefully we’ll rally together and somehow move forward to better our country. Such a mighty BIG subject this one & even here, all the way around the opposite side of the world you guys call “Down Under” we were not left unaffected as America spoke as one on your election day for change. So, I wish for America that caring & acceptance & loving & joy comes back into fashion as everyone around the world loves what your nation stands for. I want to share with you! But honestly, I totally respect both candidates. They are very talented, and has created the authority for themselves. For politics, there are many secrets are not susceptible unveiled. Two candidates in this election, they are no longer an independent individual, they now represent their party. And whether they and their party choose what aisle, I think they all have one thing in common is the national spirit, all for America. And each of us, the usual people, even though the world has shaken up to what level, we still have to continue to live and live very kind, very enthusiastic, very meaningful for ourself, family, beloved people. Of course, must have fun in life, too! I hope that you also have the belief in future, and in people, including our new president whatever who is he, like me! Emily, thank you for sharing here! I enjoyed reading your perspective on the importance of continuing to live with kindness and spirit. I definitely agree that that kind of shared fellow-feeling will be even more vital than ever from here on out. And while it’s important for me to say honestly that I don’t agree with both candidates’ platforms equally, I do think that cooperative change moving forward will be critical to that meaningful life that you mentioned. Thanks again for sharing, and I hope that you keep finding ways to believe and stay kind. Happiest of holidays, Emily!